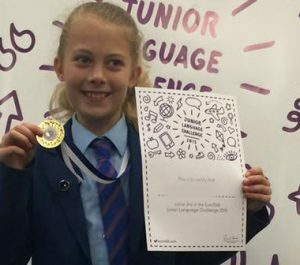 Congratulations to Isobel and Laura who took part in the Junior Language Challenge Final in Olympia in London. Isobel and Laura had to learn Arabic and endured some very demanding exercises on the day. Over a thousand pupils took part in the challenge and to make it through to the top thirty was an outstanding achievement in itself. A huge congraulations to Isobel who won third place.